Lines of Symmetry is a GxB or BxG slice of life visual novel. The lives of six high schoolers are turned upside-down when Isaac, who was once a close friend to a fellow student named Maya, decides to return to school after several years of absence. Isaac; an aloof and often forgetful boy, attempts to reconnect with old friends, but is disillusioned by how much they have changed. 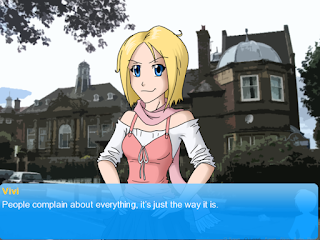 Maya; a somewhat-nervous yet mostly steadfast girl, is thrown for a loop when her ex-boyfriend of two years; Jayne, suddenly shows up out of nowhere, and is forced to come to terms with an unresolved breakup. - The monologues are quite... philosophical. Haha, sorry, I can't really explain it. But I like the way the writer evokes emotions in the inner monologues. Like the one in the beginning? I... like that. - The idea itself. When I first saw this in LemmaSoft, I got really interested. - the title, ooooh, the title sounds really nice. Intriguing. 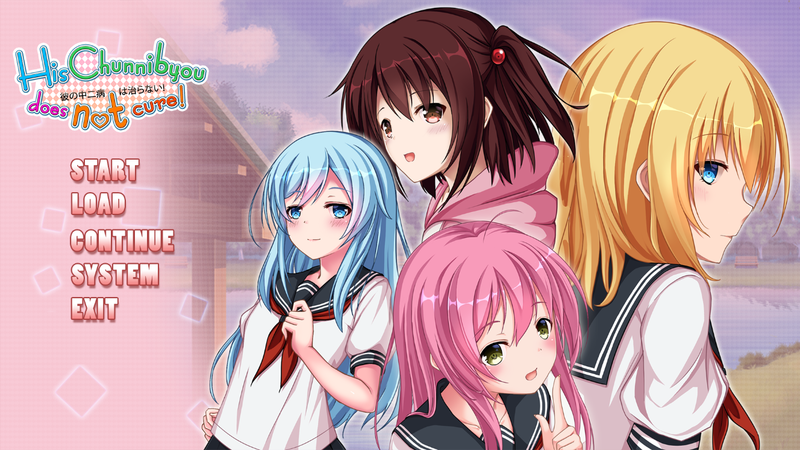 I don't usually comment on the titles of visual novels, but I realy like the title of this one. - The title screen, for me, is a really good one. 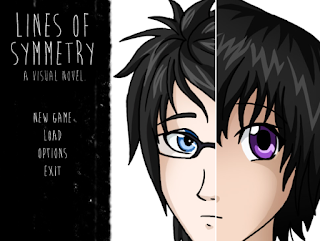 It shows this "Lines of Symmetry" idea with the drawing, and, I think it's perfect for the game as well. - In this VN, you get to choose a "path" for you, whether it's Maya's or Isaac's. Like the title implies, their lives are symmetrical to each other. Not exactly similar, but almost as if they were moving on the same line or something. They were intertwined. Hah. Lines of symmetry, right? :) And you know, I like how the plot was built around that. 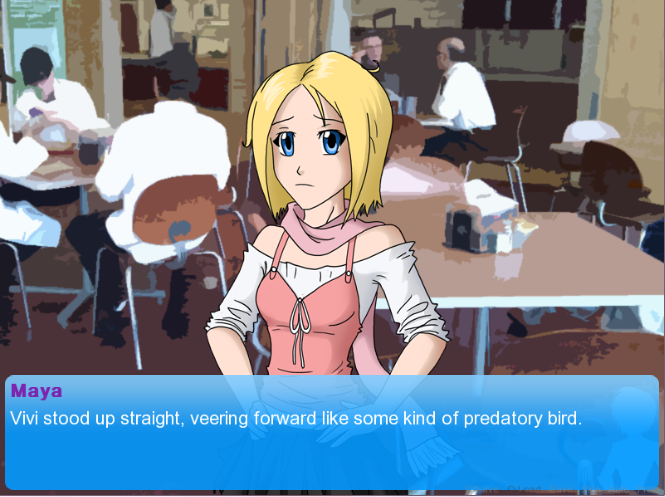 There's a lot of character-- err, not exactly development-- involvement (?) 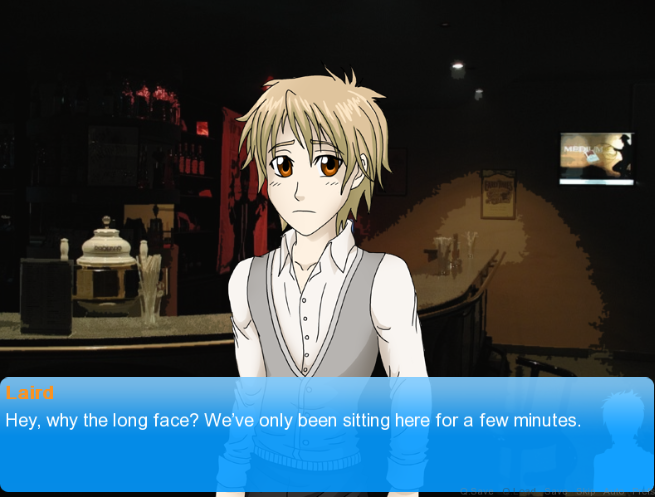 in this VN. Another point for that. - The textbox. Actually, there's nothing wrong with it but... I just personally don't like how it... doesn't fit with the overall "hue" of the backgrounds. I guess the blue is a little bit too bright for the dim BGs. - Some parts were a bit confusing. Just like his conversation with his sister near the start of the story. She didn't even have a namebox or anything. I was thoroughly confused. I thought, maybe he was talking to a ghost or to himself. Sure, he was on the phone, but I think having a name will clear this up. Like I said, I like the idea, and I like the way it was presented. The lives of Maya and Isaac were intertwined in such a "it's-a-small-world" way and I guess that's what totally caught me. However, due to its nature of changing narrators quite often, I was lost almost... a quarter of the time I was reading this. Maybe it'd be best if there was a side image for both the MCs? That could be possible, and really easy to do too. I admit, some people dislike that because... I think it removes the immersion for them or something, but some, like me, like that a lot, since we get to see the main character as well. I guess it really depends on a person. 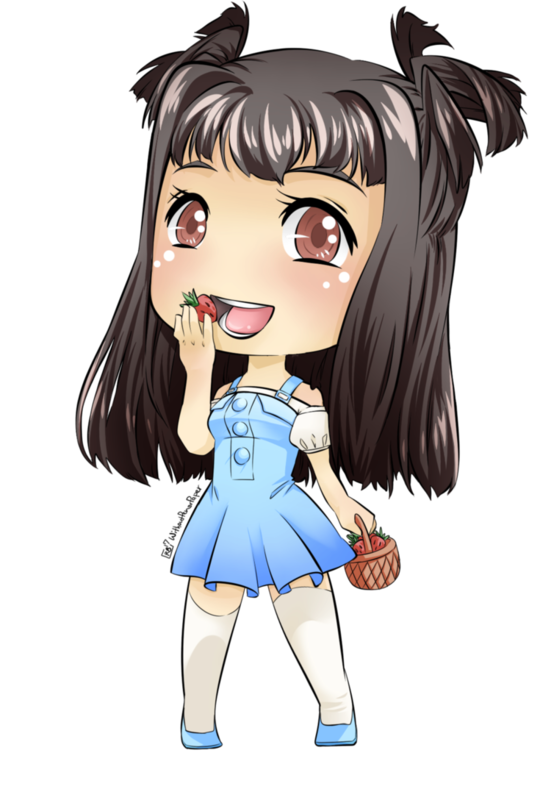 Let me give this 7 out of 10 strawberries. The writing is good, and the story is nice as well, but... there's something about it that's... missing. It lacks something, and I can't quite pinpoint what it is. But it's still just a work in progress, and it's only a demo, so I bet the final product will be more polished.